Quantcast ranks websites by the number of visitors each month. The websites with the search icon are highly accurate. The other websites are not verified and less accurate. Here are the top 100 websites and their monthly visitors. Quantcast has a free program to help website publishers learn more about the engagement of website visitors. More information related to this program to follow with another article later this month. Need More Reviews? Drop everything and Read This! I have dropped everything to share this discovery with you, my main street local business followers and techie affiliates. Over the last 2 years I have been looking for more ways to gently remind clients and others interested in my blog and online content that I need reviews. I have talked with several app developers that have the answer but it involved a subscription fee, often with a minimum of 12 months commitment, and a learning curve that begins with the setup of yet another dashboard to manage the app. Today I was reviewing a client's Google My Business listing and at the bottom of the page there was a link to a Google developer page. That page led me to discover this method of sharing a review link. Here's a short video showcasing recent video projects produced by BTG Solutions. The first part of the video is without sound, and provides ideas for ways businesses can use video to reach their audience. You can experience each of these videos on this page. Following along behind are three videos that have been produced for my company. If you are intrigued by video, and realize the powerful impact it can have for your main street business, you can call Tami at 248-345-2054. Or you can also complete this NO OBLIGATION form to provide general information that is relevant for your business goals when utilizing video. 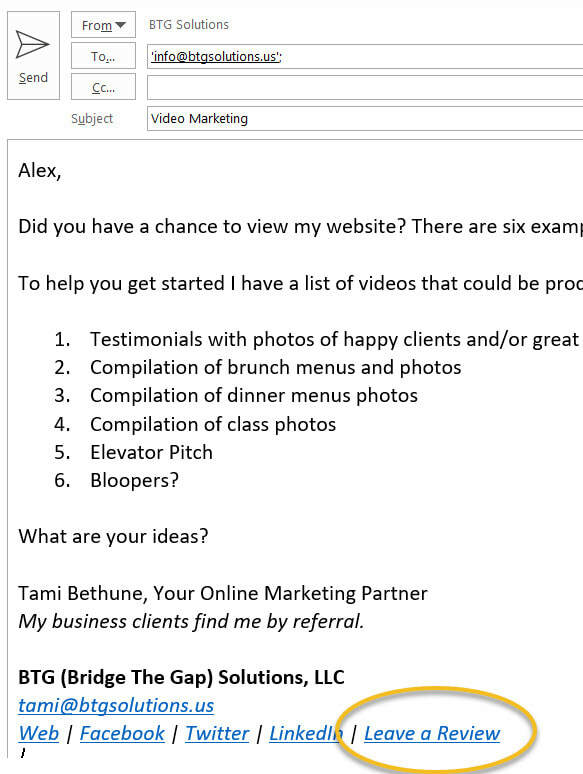 ​When you call BTG you will hear "Hello this is Tami". No menu of choices that take you to no one you know who could be someone who doesn't care. Google My Business continues to make improvements for main street business owners. 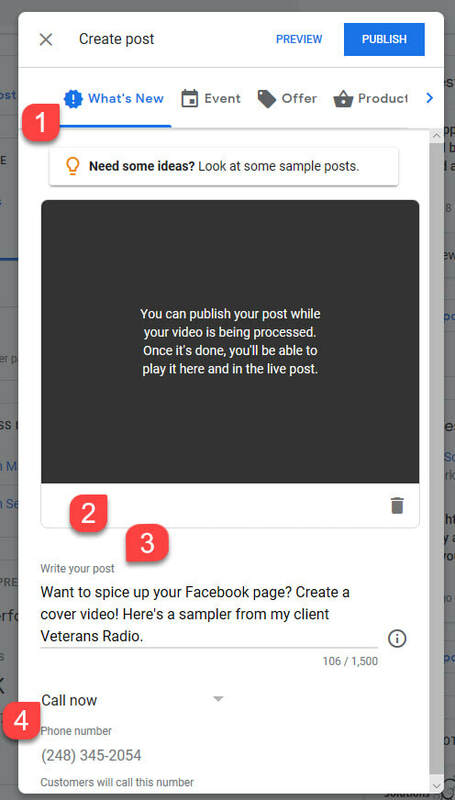 Below is a screenshot of the process for creating a post. Step 1 - Choose one of the four categories. Events and Offers are "sticky content" and will remain active until the through date. What's New and Product posts remain active for only 7 days.